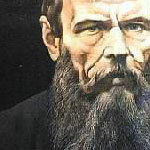 Artists can be incredible idiots when it comes to politics and Fyodor Mikhaylovich Dostoyevsky (Фёдор Миха́йлович Достое́вский) was no exception. He was recruited on the Nevsky Prospekt by a self-styled revolutionary named Petrashevsky, but the Tsar’s secret police had been observing Petrashevsky for fourteen months. The entire circle of would-be revolutionaries was arrested and sentenced to death. The order was given to the soldiers to load their guns. After the hoods were lowered over their eyes, and the soldiers were taking aim, a messenger of Tsar Nicolas arrived, and the sentence was commuted in extremis. One of the men, Grigoryev, went mad on the spot. Dostoyevsky’s first early achievement was to consciously create the perfect conditions for a writer. Awaiting execution in St Peter and Paul fortress, he was more bored than anything – it was better, he wrote, than the paranoia he generally felt about life before the arrest. Then, sentenced to death, the last second reprieve, and Siberia – how do you top that? Nothing to do but get down to it – and surrounded by a collection of fellow misfits and saints deemed by the Tsar as unfit for the particular purpose known as freedom. Nothing to read but the Bible in several translations, Shakespeare and Jane Eyre of all things. That last one a hidden blessing, some real Victorian tea and scones shite so he never forgot how bad writing can get. What a non-writer cannot understand is that the pure happiness claimed by Dostoyevksy is completely fabricated. He was ecstatic, all right, but ecstatic that he had been granted the fate of being first sentenced to death and then reprieved, which allowed him to write with authority on the issues which obsessed him. His aim had nothing to do with not despairing, and everything to do with ruthlessly tracking the mind set of a man who may or may not be him, seeking redemption.